In the early modern period, botany still remained a relatively new arrival at the top table of knowledge. Much botanical work was not done in universities, colleges, academies, laboratories, or botanic gardens (usually associated with univer­sities), but behind the walls of different kinds of gardens – of the royalty as well as of common people, of monasteries as well as public gardens. 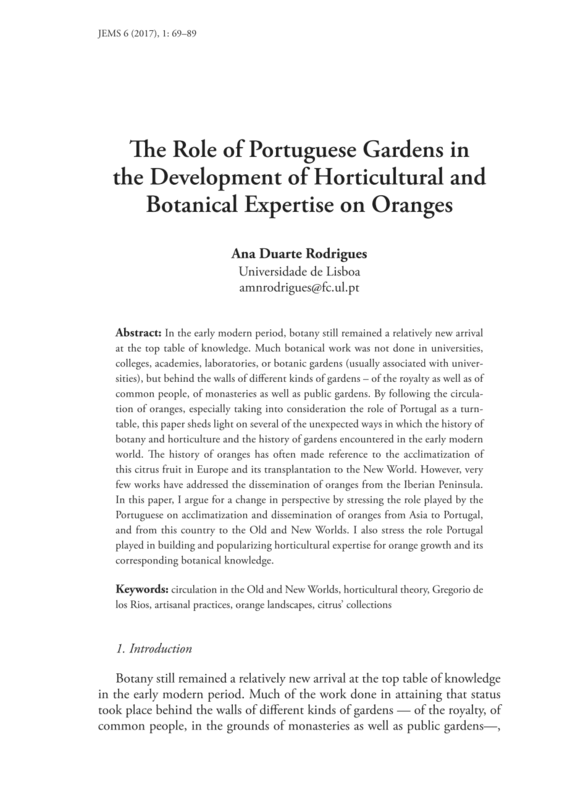 By following the circula­tion of oranges, especially taking into consideration the role of Portugal as a turn­table, this paper sheds light on several of the unexpected ways in which the history of botany and horticulture and the history of gardens encountered in the early modern world. The history of oranges has often made reference to the acclimatization of this citrus fruit in Europe and its transplantation to the New World. However, very few works have addressed the dissemination of oranges from the Iberian Peninsula. In this paper, I argue for a change in perspective by stressing the role played by the Portuguese on acclimatization and dissemination of oranges from Asia to Portugal, and from this country to the Old and New Worlds. I also stress the role Portugal played in building and popularizing horticultural expertise for orange growth and its corresponding botanical knowledge.